‘Space Invaders’: Are Smartphones Really Transforming Parents and Adolescents’ Ways of Communicating? Marina Everri takes a closer look at the ways in which smartphones impact family life in Italy, and whether they are changing the ways in which parents and adolescents interact. Marina is a Marie Curie Research Fellow at the Department of Psychological and Behavioural Science at the London School of Economics and Political Science, UK. Recent surveys show that teenagers mainly access the internet through their smartphones, with the use of other mobile devices, such as tablets, limited, especially in some European countries such as Italy and Romania. 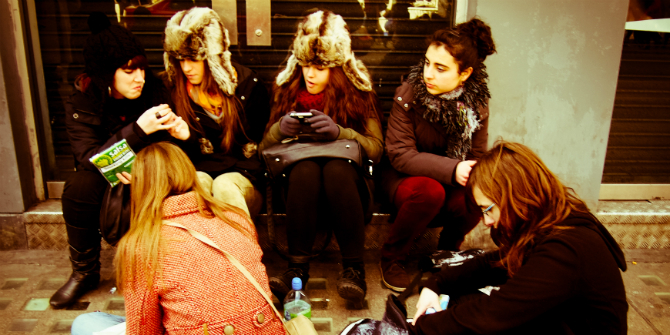 This has made smartphones the privileged device through which most Italian adolescents access the internet. Do smartphones help to reduce the digital divide? Do smartphones give children more opportunities to develop internet skills? Do children encounter more risks or opportunities when initiating and maintaining peer and family relationships by using smartphones? Research into mobile phones has only recently developed, so there is, as yet, no definitive answer to these questions. What emerges clearly from initial findings, however, is that children’s use of smartphones, especially in the age range 13–15, is considerable, entails ‘full-time’ contact, activates mixed emotions, and often becomes the hub for parent-children conflicts. In today’s families’ domestic life, smartphones can be considered as ‘space invaders’. They are high-tech handheld objects, physically entering a domestic space, with the freedom offered by portability, yet with the need for specific rules, such as where they should be located during family mealtimes or children’s homework time. Similarly, they have invaded psychological and interpersonal space, interrupting the flow of face-to-face interactions, demanding quick decision-making or requiring strategies to coordinate online and offline conversations. Smartphones are challenging the rules of everyday routines and, more broadly, of interpersonal communication. But are they transforming the ways in which parents and adolescents interact and communicate? In 2012, I interviewed Italian families with children aged 13–15 as part of a large multi-method research project. Although the focus was not on digital media, participants (mainly parents) would bring up issues to do with the internet and digital technology. They pointed out that smartphones, which in Italy at that time were only just entering our lives, and especially those of our children, were at the core of parent-children conflicts. Cristina, a 15-year-old, engaged in a half-hour confrontation with her father about the fact that she did not want to go out at night, preferring to lie on her bed and chat and post things on Facebook using her brand-new smartphone. Cristina’s father insisted she was too isolated and that he would have been more than happy to take her to the disco every Saturday night and pick her up, even after two o’clock in the morning! I was astonished: I remember thinking back to when I was Cristina’s age and of all the times I had argued with my father about going out at night. Another exchange struck me: the mother of Marco, a very shy 14-year-old with a passion for acting, stated that she was sick of “that thing called Facebook”, as Marco was constantly distracted by it. So she decided to ban him from using it for six months, and confiscated his mobile phone. Marco timidly replied that Facebook allowed him to stay in contact with groups of theatre actors he really liked, and to keep in touch with other teenagers sharing the same passion. I felt that Marco’s mother’s decision was unfair, and shared his frustration at not being allowed to share his passions with his peers. I empathised with the adolescents, but also felt parents’ confusion and genuine concern for their children’s wellbeing, together with a sense of guilt for having been the primary providers of the smartphones. Parental preoccupations and concerns regarding smartphones revolved around four main issues: (a) isolation, (b) dependency, (c) time wasting and (d) distraction. Indeed, parents seemed more worried about the use of the device in itself rather than the activities undertaken on the internet by their children. Similar topics were raised in the focus groups that my colleagues and I recently conducted with parents, children and adolescents in Italy. Unexpectedly, their opinions overlap, with both seeming to acknowledge the negative impact of smartphones on relationships, complaining about the ‘full-time’ contact that these devices afford. This lets us suppose that either (a) children have started feeling the ‘costs’ more than the ‘opportunities’ of using smartphones as communicative affordances to nurture and expand their relationships, regretting the loss of a pre-technological era (most told me that they would prefer not to own a smartphone), or (b) parents and children are imbued with today’s dominant discourses around screen mobile devices that mainly emphasise risks, providing parents with recommendations, based on a rule-led approach rather than a closer examination of ‘local’ parents-children relational dynamics based on a context-led approach. If Italian families seem to mainly identify with the negative aspects of smartphones, the actions recently taken by stakeholders (e.g. Telefono Azzurro) have primarily stressed the issue of ‘protection and safety’. These are undoubtedly relevant aspects, but confirm a negative connotation. A complementary focus on the opportunities offered by mobile connection should also be taken into consideration. Parents and children should be helped in developing a more ‘balanced’ approach to the use of smartphones, to balance their usefulness and uselessness depending on their goals, desires, emotions and situations. Recommendations are important, but should be considered as only a general framework in which to situate a closer investigation of the characteristics of family context. Strategies and resources that both parents and children can use to deal with the smartphones (‘space invaders’) that have already ‘colonised’ our day-to-day lives. Research conducted using a bottom-up perspective or context-led approach could provide more insights into how such a ‘colonisation’ can be turned, instead, into ‘integration’ in our practices and routines, and be harnessed to fulfil our scopes and needs. After all, was this not the initial function of mobile devices?